Welcome to Teen Scene. Each month our young authors write, in their own voice, stories that will educate and inform fellow students and parents. If you are a teen who would like to write your story, contact the Journal. We’ll help you polish it up, so don’t worry, let’s just get to sharing. This month’s author is Middletown’s Sophia Ziajski, a 17-year-old junior at the Academy of Allied Health and Science. Every one of us has seen something that has made our blood boil, but very few actually say “I’m going to do something about it”. When Sophia learned that there were not enough activities for older special needs children, she set about a course of action to correct it. Along the way, she learned a lot about the challenges you face trying to improve the lives of others. She also learned a lot about determination and perseverance. Here is Sophia’s story. This past July I came to the troubling realization that despite the current efforts being made to make society more supportive, children with special needs continue to feel isolated, insecure, and incapable of making friends. An old friend from middle school asked me for advice about friendship-making opportunities in the community. My friend’s brother is autistic and he was having difficulties making friends during his transition into middle school. He felt excluded, so I immediately began looking for friend-making activities for her brother. I learned that the majority of the area’s nonprofits have long waitlists, are strictly sports-oriented, or tend to accept a larger amount of elementary-school-aged participants. There was a need for better integration and support for young adolescents with special needs. Enraged by my findings, I told my friend that I would create a group that would allow her brother to make more friends. I have made many friends with intellectual disabilities who have also struggled to assimilate with their peers. I felt I could design a group that could provide perfect opportunities for any teen struggling to find companionship. Forming the group Kids Connect required much motivation, time, and effort. After creating the name Kids Connect, I self-developed the website, database, social media, and advertising materials for the group. I created the budget for materials, permits, and additional costs, for our first event: a field day at Bodman Park in Middletown. I took on more hours of work during the summer to pay for the event because I felt that no child should have to pay to participate in a typical teenage outing. Since there are not many choices for older kids I made sure they were activities that would appeal to middle school and high school kids. I planned activities for everyone to enjoy including art, sports, games, and other event-specific activities. In August of 2017, just a month after starting up my idea, I announced the event. We were warmly greeted by followers, volunteers, and participants who advocated for the group. Parents from as far as Hoboken asked if their children could participate in my program. By the first event at the end of August, we were able to recruit nearly fifty volunteers and participants combined. By our second event in October, we nearly doubled the number of participants and volunteers in our database. 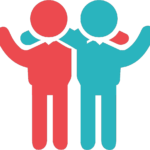 The database enabled friendship pairs to be created based upon interest-survey data collected during the registration process. The optional interest-survey lessened the awkwardness between participants and volunteers so that bonding would become easier. Our group grew with each event, and our message of kindness and inclusion spread throughout the community leaving a lasting, positive impact. After hosting the first two events, I came face-to-face with legal resistance. Since I am under eighteen-years-old, I was not able to incorporate my group as a nonprofit. After much research, I discovered the option of Comprehensive Fiscal Sponsorship, which allows another nonprofit to cover the liabilities of an unrecognized group while they await incorporation. I pitched the idea to over twenty-five different nonprofits. Less than ten replied, and three entertained the idea for months, but none followed through. I was heartbroken. I was staring at a brick wall tha t I could not overcome. I spent a couple of months deciding if I should abandon my idea or if I should do as another nonprofit strongly suggested and open a new branch of their nonprofit. The night that I had to make a final decision, I received an email from one of the participant’s parents who shared what a positive impact our event made. She told me that her son continues to smile at the pictures from field day and exclaims “friends” as he reminisces. I decided that there had to be another way to make it work. I searched for weeks to find a group of attorneys willing to assist me in the incorporation process. Working alongside one of our participant’s parents, we collaboratively planned the future of Kids Connect and began actively searching for potential board members. We hope to begin our process of incorporation within the next month so that Kids Connect can be recognized as a legal entity by the state with a tax-exempt 501(c) (3) status in the spring. We are currently searching for logo-designers, sponsors, software-developers, fundraising coordinators, volunteers, and interested participants for the launch of our newly developed programs and invite you to follow us at @njkidsconnect on Instagram, Twitter, Facebook, and at www.njkidsconnect.weebly.com or email info.njkidsconnect@gmail.com.